In this lesson, we will learn how to find the slope of a linear function represented by a given table or graph. 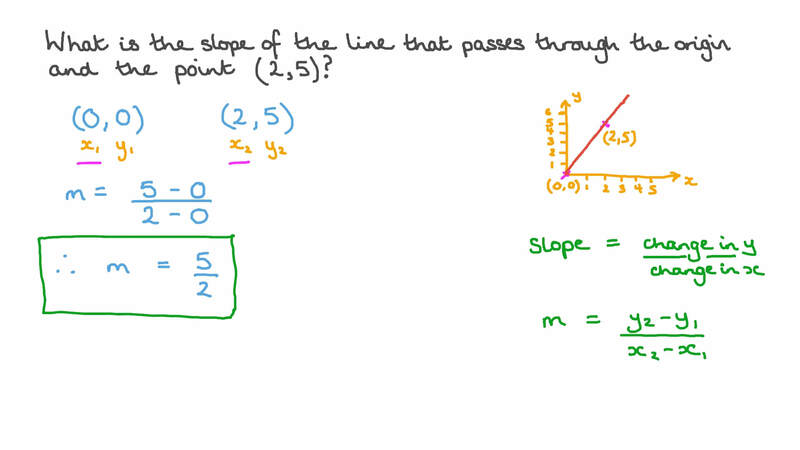 What is the slope of the line that passes through the origin and the point (2, 5)? Using the fact that the slope is the same between any two distinct points on a nonvertical line in the coordinate plane, calculate the value of 𝑦 in the graph. Adel went on holiday. The graph represents the amount of money he spent there. Determine the amount he spent daily. The graph below represents a relation between the time 𝑡 in hours and the amount of fuel in a car tank 𝑦 in litres. Determine the amount of fuel remaining after 15 hours of driving and the amount of fuel consumed per hour. AThe amount of remaining fuel is 24 litres and the amount of fuel consumed is 2 2 5 litres per hour. BThe amount of remaining fuel is 3 5 litres and the amount of fuel consumed is 2 2 5 litres per hour. CThe amount of remaining fuel is 36 litres and the amount of fuel consumed is 2 2 5 litres per hour. DThe amount of remaining fuel is 24 litres and the amount of fuel consumed is 5 1 2 litres per hour. The graph below represents the movement of a bicycle measured from a constant point. Calculate the velocity of the bicycle during the first four hours and during the next five hours. AThe first velocity is 75 km/h, and the second velocity is − 2 0 km/h. BThe first velocity is 1 1 2 1 2 km/h, and the second velocity is − 3 8 8 9 km/h. CThe first velocity is 1 1 2 1 2 km/h, and the second velocity is − 7 9 km/h. DThe first velocity is 450 km/h, and the second velocity is − 3 5 0 km/h. A farmer decided to dig a well. The graph represents the time in hours to dig the well ( 𝑡 ) against the depth of the well in metres ( 𝑑 ) . Find the depth of the well before digging, the time it took to finish digging, and the average digging depth per hour during the first six hours. The graph shows the relation between time 𝑡 , and pages remaining of a book being read 𝑦 . Assuming the relation continues to be linear, find the number of pages in the book, the number of pages read per hour, and the number of hours it will take to finish the book. AThe number of pages in the book is 120, the number of pages read per hour is 20, and it will take 6 hours to finish the book. BThe number of pages in the book is 120, the number of pages read per hour is 10, and it will take 6 hours to finish the book. CThe number of pages in the book is 6, the number of pages read per hour is 1 2 0 , and it will take 120 hours to finish the book. DThe number of pages in the book is 6, the number of pages read per hour is 20, and it will take 120 hours to finish the book. A man drove his car from City 𝐴 to City 𝐵 as shown in the figure where 𝑑 is the distance in kilometres travelled and 𝑡 is the time in hours. Find the uniform velocity of the car and the distance between the car and point 0 after 3 hours. The figure shows the relation between the amount of fuel left in a tank ( 𝑦 ) and the time in hours ( 𝑡 ) . Find the greatest capacity of the tank and how long it will take to be emptied. The graph shows the distance travelled over time by a car. Find the average velocity of the car for the first four hours and then over the next three hours. AThe first velocity is 1 2 1 2 km/h, and the second velocity is 8 3 1 3 km/h. BThe first velocity is 1 2 1 2 km/h, and the second velocity is 4 2 6 7 km/h. CThe first velocity is 1 2 1 2 km/h, and the second velocity is 6 7 km/h. DThe first velocity is 50 km/h, and the second velocity is 4 2 6 7 km/h. The graph shows the distance a car travelled over time. Given that the car moved at a constant speed, determine the speed the car was moving at. The graph shows the displacement of a cyclist over time. Calculate the total distance covered. The graph shows the distance a car travelled over a period of time. Calculate the average speed that the car travelled with. The graph shows the relationship between the fuel in a car and the distance the car has travelled. Assuming that the relationship continues to be linear, determine the distance the car will have travelled when it runs out of fuel. The graph below represents the depth 𝑑 of a well in metres after the time 𝑡 in hours. Find the final depth of the well and the average depth per hour in the last four hours. AThe final depth is 40 m, and the average depth per hour for the last four hours is 1 1 4 m/h. BThe final depth is 5 m, and the average depth per hour for the last four hours is 1 1 4 m/h. CThe final depth is 40 m, and the average depth per hour for the last four hours is 2 1 5 m/h. DThe final depth is 40 m, and the average depth per hour for the last four hours is 7 1 2 m/h. The graph shows the height of a person in centimeters against their age in years. Calculate the difference between their height when they are 9 and 45 years old. The graph shows the capital of a company over 8 years. What was the starting capital? The given figure represents the paths of two trains 𝐴 and 𝐵 between two railway stations, where 𝑑 is the distance in kilometres, and 𝑡 is the time in hours. Determine the distance between the two stations, and find the time taken by each train to cover that distance. The points in the table belong to the same line. Find the slope and the 𝑦 -intercept of the line.